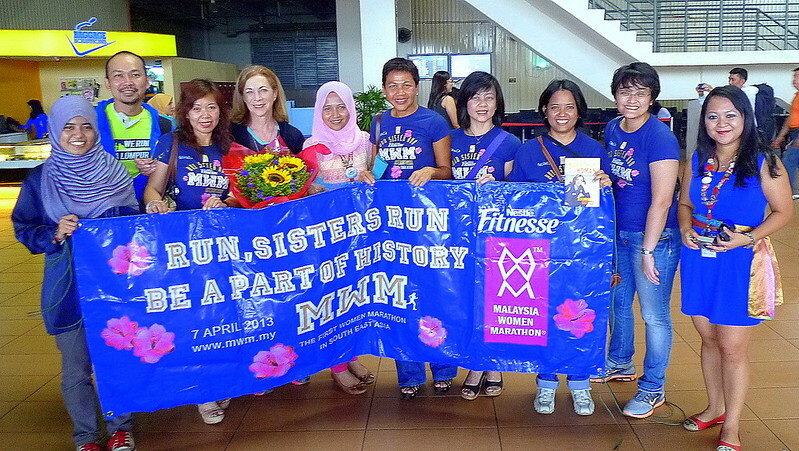 Welcome to Malaysia, Kathrine Switzer! Welcoming a running legend to Malaysia for the Nestle Fitnesse Malaysia Women Marathon. When Maggie Yeo left a message on Facebook asking me to be part of a welcoming committee to greet legendary marathon runner Kathrine Switzer at the airport on 3rd April, my answer was a no-brainer “YES!” Here was an opportunity to have an up-close and personal meeting with the first lady who ever ran as a numbered entry at the Boston Marathon in 1967 during a time when women were not even allowed to compete – and who has since rocked history and paved the way for women to officially participate in long distance running! I just had to be there when she arrived. When the day came, I drove over to Maggie’s home in PJ, and Lini was already there having a drink. Jolene, Lina and her husband Zaini arrived about 20 minutes after me. There were only a few of us as we wanted to keep the crowd small and manageable. Maggie had an extra MWM t-shirt for me to use, which was nice. We all wore the same t-shirts to form a uniform look. The Tourism Selangor Board had commissioned a driver and a van for us to pick up Ms. Switzer, so Maggie, Jolene, Lini and I squeezed in, while Lina and hubby drove separately in their car. So in two vehicles we fought the evening traffic that was rapidly building up and rumbled down southbound towards the Low Cost Carrier Terminal Airport in Sepang where Ms. Switzer was due to arrive from her Sydney transit at around 17:55 (she is actually based in Wellington, New Zealand half of the year). Upon arriving at LCCT, we – being the forever hungry Malaysians that we were – decided to grab some tea, coffee and snacks at Old Town Coffee, which was strategically situated opposite the International Arrivals exit. Apparently Hanim wasn’t the only one who thought Ms. Switzer was arriving at the other international airport. Max, who was assigned to bring a bouquet of flowers, called Maggie and asked why we were nowhere to be seen in KLIA! “Because we’re at LCCT, Max – quick grab a cab and come over here!” replied Maggie over the phone as I munched on my toasted bread and kaya. Max eventually arrived with a large bouquet of sunflowers. “The weather has been glum lately,” he says, “so I got the sunflowers to offset that.” That was an excellent decision. As we’re casually having our food (Lini in fact was having her dinner at 5pm – prawn mee! ), Hanim calls and gushed, “Kathrine has landed!” But it’s only 5:30pm, I said. Her flight is scheduled to land at 5:30pm, not 5:55pm! Oops! At this point I scarfed through my food and slurped down my drink in a hurry because I was afraid Ms. Switzer was going to pop out of that exit and we’d all still be eating. Since Hanim had access to enter the arrival lounge, she went in with Yvonne and another staff friend to greet Kathrine Switzer at the luggage carousel. Hanim even sent me a photo of Kathrine from there, which sent some of us reeling in envy at her first encounter. The rest of us who were still at Old Town finally got up from our table, brushed the crumbs off our laps and assembled just outside the arrival area exit. I started to unroll the giant banner that Fred, Karen Loh (MWM race director)’s husband and designer of the MWM logo – had printed for us. We each held a segment of the banner, stood behind it and posed for a few photo shots, so much that we joked we might miss Kathrine if we kept it up! Soon after we see Ms. Switzer approaching the exit, escorted by Hanim and Yvonne who is pushing her luggage cart. Ms. Switzer is casual smartly dressed in a black jacket and pants and a pair of Saucony shoes. She sees us with the giant banner and her face lit up as we hooted, clapped and cheered! We were so excited to see her, as she was to see us! Everyone received a warm hug from Kathrine, which I thought was really nice. She was such a warm and lovely person, and the way she talks to you is as though she has known you for years. Since everyone wanted a photo op with her, we decided to take turns and do it at the airport while we still had the opportunity. As the others were going through their turns, I started to fumble in my bag for my copy of Marathon Woman book for Ms. Switzer to sign. “It may not make sense to you now,” Ms. Switzer starts, “but you will get it eventually,” she continues with a twinkle in her eye. I hugged her to show my appreciation, totally stoked that my paperback has now been officially autographed by the author herself. Along the drive back to PJ, Ms. Switzer talked about many things that had us gaping in wonderment. It was a bit of a chuckle too that she had a tendency to start her stories with, “Before you were born…!” After all she has been through many ups and downs as long as our parents had! There were so many things that were discussed about in the van ride with Ms. Switzer, here is a recap of some of the topics which I remembered. But first – as we piled up Ms. Switzer’s luggage in the van we find that a little bit more squeezing needs to be done as her largest suitcase had to be placed on the front passenger seat. Alas that is Asian vehicle capacity for you, even if it is a van. I squeezed in the backseat with Jolene and Lini, and Ms. Switzer sat in the second row with Maggie and Max. Hey, when you’re with like-minded friends in the company of a legendary runner, who cares if you have to endure a drive that’ll leave half your bum asleep? As we were getting out of Sepang vicinity, we passed by the KLIA Mosque, which instantly captivated Ms. Switzer. She asked if that was the Sultan Salahuddin Abdul Aziz blue mosque that was promoted as an attraction along the MWM race route. We said no, this is just one mosque in Sepang. She seemed very keen to visit the blue mosque; I think she finds the architecture beautiful. To start the story-telling, Lini asked, “Is this your first time in Malaysia?” Ms. Switzer answers that it is not, and that she first came to the country in the early 1980s when she helped to organize ladies’ race events for Avon! It was at this point we were gawking with awe, as we had no idea that Malaysia even held women-specific running events back in the day! Ms. Switzer goes on to say that the lady who came out champion from the Avon event went on to compete in Olympic Trials Los Angeles in 1983, which was significant since it was the first year that women were allowed to run long distances. Ms. Switzer also regaled about the one time she was in Malaysia in the ‘80s and had been travelling for 5 weeks up until then. Determined to do a bit of Lonely Planet-style travelling and finally soak in a bit of the country, she insisted on taking a train ride from KL to Singapore, much to the horror of the folks who were managing her trips. They tell her, “the trains are old and rickety [back then]. You won’t see anything scenic along the way except for banana trees!” I don’t care, she says, determined to take the train ride. And so she did, and true enough she saw nothing but banana trees throughout. To make matters worse, the air-conditioning had broken down on the train and because she had to open the windows for air circulation, she was caked by dust by the end of her ride. Upon arriving in Singapore, she looked and felt as though she had ran a marathon because she was soaked with sweat. The best part was that her welcoming committee in Singapore had planned to bring her to eat at the Raffles Hotel in a grand dining area! In the end she insisted they ate outdoors. We talked about other things too like the rising trend of running in Malaysia. Maggie also raised the topic of how the cash prizes for women in Malaysia are always lower than the men’s – which caught Kathrine by surprise, as this was not the case in Europe and America. The argument Maggie gave was that women ran as far as the men, and even pay the same registration fee – so why should they receive less money for securing a podium placement? This is a question that remains unanswered, even after organizers have been written to and inquired. Ms. Swizter also shared some stories about her husband, who is a New Zealand native and world championship runner, Roger Robinson. They had first met while giving a speech at a race in which Avon sponsored the women and Nike, the men (which interestingly also had two different start and finish lines for the two sexes!). She jokes that people often asked her why she wrote more about her ex-husband in her Marathon Woman book than her current husband! Well to be fair, her book contains stories about her early life up until 1984. Speaking of her Marathon Book, we asked what inspired her write it. Ms. Switzer says that she finally decided to write in in the last decade because her story of running at the Boston Marathon in the ’60s was getting so mythologized that she felt the record needed to be set straight. “I am in my 60s now, it’s time for me to tell my story,” she says with a smile. Some unreliable sources started rumors that Kathrine had bunched her hair up in a hat to pass off as a man that fateful day in 1967. “No such thing happened, I was even wearing lipstick!” she laughed. When asked if she likes spicy food, Ms. Switzer rolled back her eyes almost in ecstasy and says, “Oh, I love spicy food!” Apparently on the Air AsiaX flight from Sydney to KL, she did not pre-order her lunch; as her neighbor in the next seat starts tucking into her fragrant nasi lemak, a flight attendant tells Kathrine that her lunch has been pre-booked by someone (much to her delight). That was until she found out that it was chicken lasagna. Which was fine, she says with a chuckle, but secretly she was more tempted by the aroma of spicy sambal and fried anchovies of the coconut milk-cooked rice dish! Needless to say Kathrine can hold her spices in – so Malaysia definitely is the place to be for eating! The van ride finally came to an end when it turned into the road where Maggie’s house stood and our cars were parked. Lini and I got out and hugged everyone farewell – it was the end of the road for us for that evening. Maggie, Max and Jolene were going to take Ms. Switzer to her hotel and then dinner later at KLCC at Madam Kwan’s for some spicy dishes, which I am sure the New York-native will enjoy. The next day will be full of PR work for Ms. Switzer as she is scheduled to appear on radio and TV to promote Malaysia Women Marathon. On Saturday she will be giving a seminar too at the MWM Pre-event in Shah Alam, which I hope to attend. On Sunday, she will flag off the race in Shah Alam. Meeting Kathrine Switzer was an absolute delight and I appreciate the chance to meet her. True to the women of her generation (of which my dear mother is also a member, at an age 2 years younger than Ms. Switzer) I found her warm, engaging and sincere. The way she pays attention to you is truly captivating; she has the most attentive eye contact and a treasure trove of the most riveting stories. When you’ve been through as many exciting and profound experiences as she has over the decades, the supply of chat material is endless. It is no wonder she is an Emmy-winning speaker and an inspiration to all. We are all so lucky to have been able to meet her in such an intimate and meaningful setting. Thank you, Maggie for calling on me to participate in this rare opportunity to meet a legend – and to the friends who were also there with me (Lini, Jolene, Hanim, Lina). I will remember it for a lifetime. Lucky u dpt jumpa dia..
Thx for the info sharing and a very Nice story from U Fairy..
All the best for this Sunday! @Bett: You’re welcome and thank you for reading. All the best to you too babe! Thumbs up for the write up babe.. n thanks for mentioning my names many times.. hahah tumpang glemer..
@Hanim: Anytime – thanks for sharing the photo of Kathrine, exclusive tu! Lucky you Fairy! Great write-up. Semangat semangat. @Millie: Thanks Kak, all the best in for your maiden FM too! I will cheer you on!